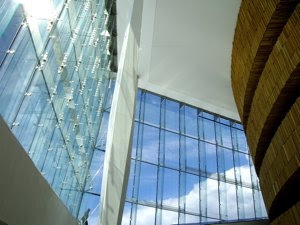 April 12th, Oslo's new opera house opened, under much pomp and circumstance. As a large iceberg it rests on the water by what will be the city's new coastline in the future. The city will reclaim what until now have been inaccessible port areas. Here you will find apartment buildings, as well as office space and a promenade that will bind the Oslo fjord and the city. The opera is the first part of a transition. And what a transition! A New Norwegian opera house had been long overdue. The first plans were launched as far back as 1917. Since then, the Norwegian opera ensemble has spent its life in temporary and often inferior locations. Slowly the plans materialized, and after 72 years - in 1989, the Opera started a work that would reach its conclusion after 19 years hard labour on April 12th 2008. This painstakingly slow process deserves a short, political diversion. I am often ashamed to be a citizen in one of the richest countries in the world. Norway has voluntarily chosen not to participate in the European Union, and is swimming in oil revenue. This small insignificant country I am living in is also populated by an impressive number of culture dummies. 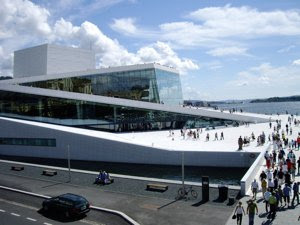 During the deliberations in the Norwegian Parliament in 1999, Fremskrittspartiet, the rapidly growing Norwegian xenophobic tax party bitterly opposed the idea that Oslo and Norway should have a National opera house. Now this party may get most votes in the coming parliament elections, and may form a core in a new right wing government. So much money, so little enlightenment! Well back to the story. 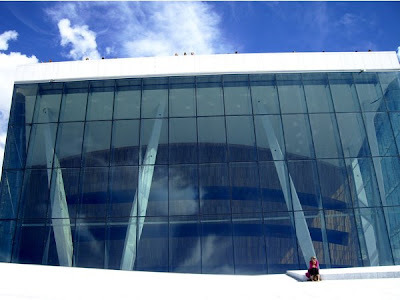 In 1999 Stortinget, the Norwegian parliament decided to build a new opera house at Bjørvika, based on designs by the world famous architects at Snøhetta. It was to be a monument, a formation and a building at the same time, and white Carrara marble would reflect the Oslo sun like ice. The price, as the building, was impressive. It was estimated to cost 3, 9 billion NOK (€480 million). 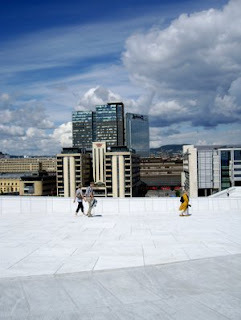 These last 9 years we have, in anticipation, seen the building rise like the fire bird Phoenix, from the ashes, and after it was opened the citizens of Oslo has flocked to walk on the building that provides contact with the sea. We strongly recommend the tourists visiting Oslo to do the same. And bring your sun glasses! The reflection of light from the marble may be hard for your eyes. 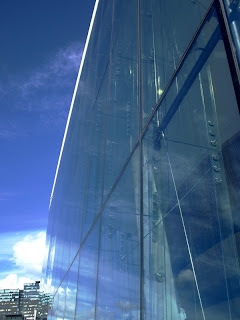 You may walk up the slopes on each side of the glass wing that make up the front of the complex, up to the roof. From here you have an exceptional view over the city with its tiny skyline, and all roofs and gables of old and new buildings of the city centre. The hall is dominated by a large wooden structure that leads up to the different balconies of the large opera room. There is a striking contrast between the cold straight lines of the structure made from Carrara marble, the open glass window and the rounded walkway in light Scandinavian wood. It is a marvellous building!!! For those of you visiting the building you may buy your own piece of marble in the opera gift shop (beware of luggage overweight), or enjoy a light meal (would probably be a better idea, since the airlines does not weigh you – yet!). The food is good, and if the weather is fine you may even sit outside facing the water. The Caesar salad is very good – I concluded. But it is an opera. I have booked tickets both in October and November, and I will share my experience here.